A team of treasure hunters to search the world for its lost & buried treasure exclusively for you! Also visit the TTT Blog. 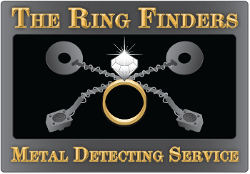 The Ring Finders Metal Detecting Service Inc.
A database of independent metal detecting specialists offering metal detector rentals, hires and services to help find your lost rings and jewelry. Also visit The Ring Finders Blog for ring finder stories from around the world. When you want your lost jewellery to FIND you! Also visit the metal detector rental blog.